Google Voice is a powerful suite of tools comprised of a dedicated phone number, call routing, caller announce, call recording, free texting, online voicemail, voicemail-to-text transcription, low-cost International calling, and more (whew!). 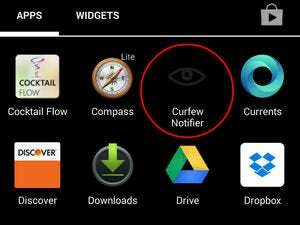 It’s an amazing suite of features, and you can leverage this service to add these killer tools to just about any phone. Best yet: Google Voice is particularly powerful when paired with an Android phone, thanks to tightly knit integration of the Android Voice app. All you need is a Google account to sign up, and you can then choose a number from one of the many available area code options. 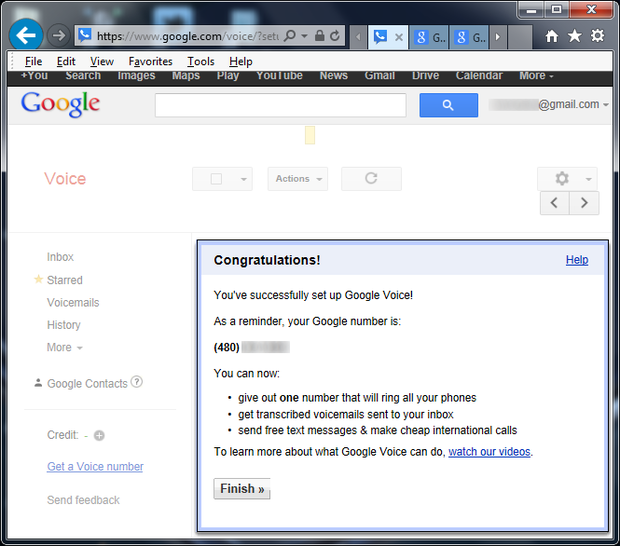 You first sign up for Google Voice via your web browser. One of the Voice features that I find most useful is Caller Announce, which Google also refers to as “call screening,” “call presentation” and “audio Caller ID.” With call screening turned on, an incoming caller is prompted to record his or her name before the call is routed to your Google Voice number. The Voice service then rings your destination number (or even numbers) and the freshly recorded name is announced to you before you answer the call. Based on the recorded announcement (do you really want to talk to this person? ), you can choose to take the call or route it to voicemail. Here you can disable call screening for a specific person. If you opt to banish a call to the abyss of the voicemail system, you can listen in live on the in-progress voice message, and even interrupt the recording mid-stream by pressing the asterisk on your dialer to connect the call. Via the Voice web interface, call screening can even be turned off for specific contacts, removing the inconvenience of announcing one’s name for people you always want to let through. Another great benefit of using Voice is that all text messaging occurs over your data connection, not over your mobile provider’s SMS gateway. Texting through Voice doesn’t chip away at your plan’s allotted text message bucket, which is an enormous benefit for folks who don’t have an unlimited messaging plan. If you want to avoid your wireless carrier’s text messaging charges altogether, Google Voice has you covered. The default screen in the Google Voice Android app is the Inbox, which displays all of your voicemails (including voice-to-text transcriptions) and all of the text messages sent or received using your voice number. In the Voice Android app settings, you can configure your phone to use Google Voice to make all calls (which will result in your Google Voice number being displayed on caller ID); to not use Google Voice for calls; or to use Voice for international calls only. You can also choose to be prompted every single time you make a call, with the option to use Google Voice or not. 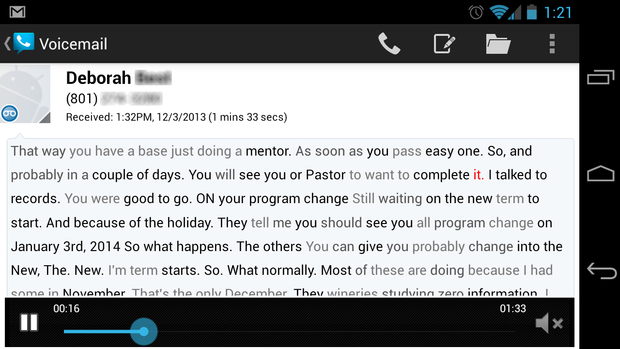 The inbox of your Android Voice app even shows voice-to-text transcriptions. The voicemail features within Voice really shine. You’ll get email notifications for all new voicemails, along with text transcriptions of new messages. You can play back a voicemail directly from the Voice app, or from within Gmail on the web. There’s no need to ever dial a number first before listening to a voicemail, as they'll all be delivered straight to your email inbox, and appear right in the Voice Android app. 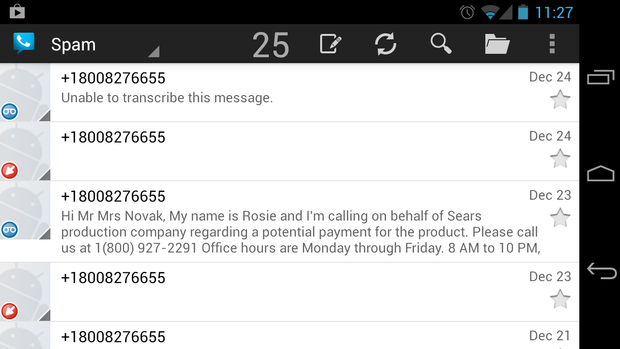 Here’s how a new voicemail email notification appears in the Gmail web app. 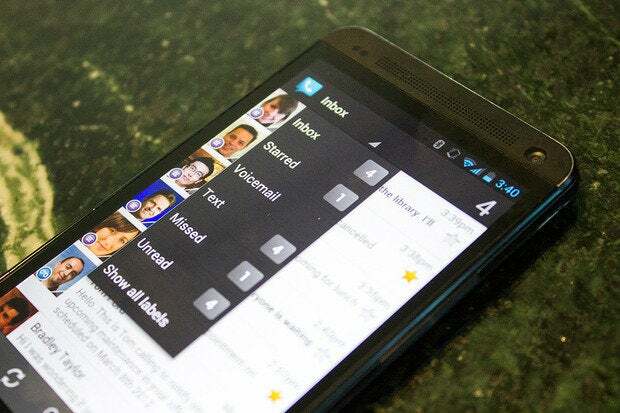 With Voice, you can also set up custom voicemail greetings per caller. For example, you can record one voicemail greeting for your Mom and another for your girlfriend, allowing for intimate customization of what the incoming caller will hear before he or she leaves a message. 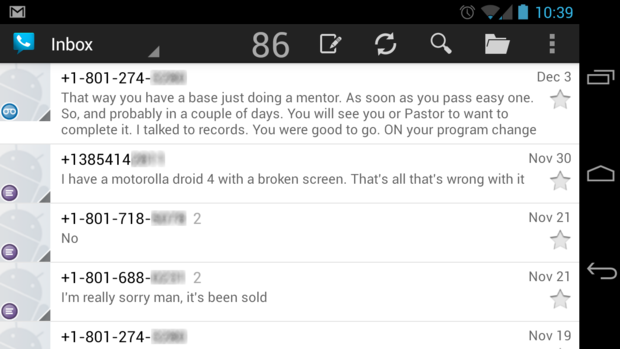 When you play a voicemail from the Google Voice Android app, you’ll see the text transcription of that voicemail right on the screen. While the audio plays, you’ll see Google Voice follow along and highlight each word in red in the transcription as the corresponding audio word is played. 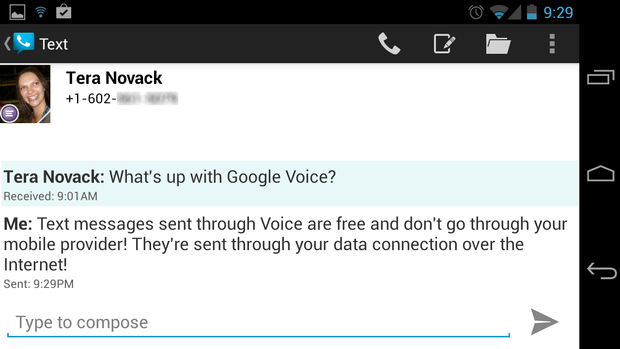 And here’s the interface for playing back a voicemail in the Voice Android app. The accuracy of the Voice audio-to-text transcription is spotty, but the presence of a few correct words and the context of sentence structure allows you to infer what the voicemail actually says. As such, you don't even need to play the audio in many cases. In the transcription text, you’ll notice that some words are highlighted darker than others. The darker the word, the more accurate the transcription—at least per Voice's own estimate of its transcription abilities. 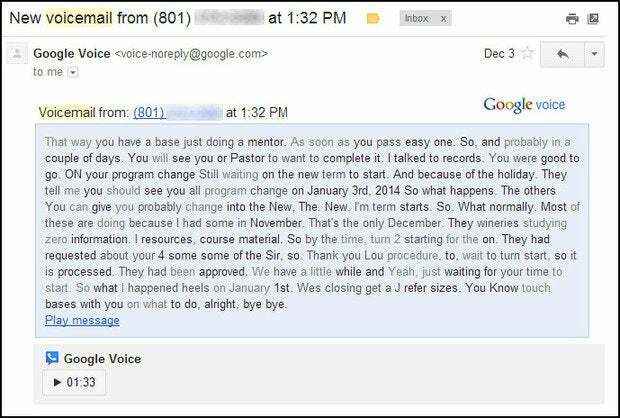 You won’t want to go back to your old, clunky, inflexible voicemail system after using Google voicemail. But guess what? You won't have to. The Voice platform makes it easy to configure your existing phone to route to Google voicemail for all unanswered calls, bypassing your wireless carrier’s inferior voicemail system. For personal contacts, I give out my direct mobile number. For anyone and everything else that requires me to provide a phone number, I give out my Google Voice number. When my Google Voice number is dialed, my mobile number and my home VoIP line both ring. Spam filtering catches calls, voicemails and text messages. Combined with the Call Screening feature and the Global Spam Filtering, my Voice number provides me with a powerful set of tools that is analogous to an incoming call firewall. To learn more about Google Voice and its abilities, check out the product videos located here. Wes Novack is a systems engineer and avid technology explorer. He's addicted to new tech and enjoys testing out new hardware, software and services.